Saturday morning was the coldest so far of this early fall; I’d remembered to bring a winter coat and scarf to Saratoga, but neglected gloves, and leaving the house at 7:45 am, I regretted the oversight. 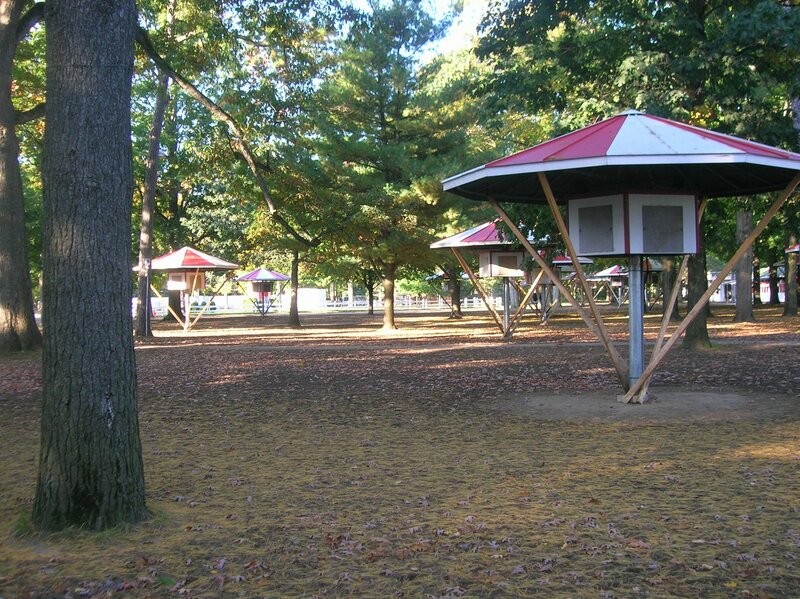 The morning was gorgeous: crisp and incredibly blue, throwing the colors in the trees into brighter relief. I couldn’t wait to get to the Oklahoma. The big entrance by the starting gate on East Avenue was locked up tight, and I entered on Union Avenue. 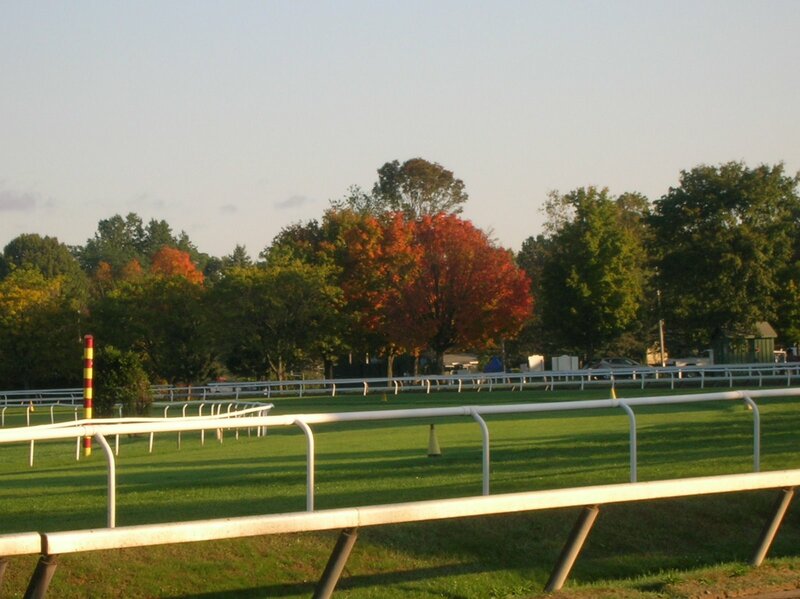 Oh, it was quiet; there were a few folks standing by the clockers’ stand and there were horses on the track, but I could walk around without fear of being run over by a horse, a car, or a speeding golf cart. It was intensely quiet; music and voices occasionally drifted past, and the horses’ hooves on the track punctuated the stillness. 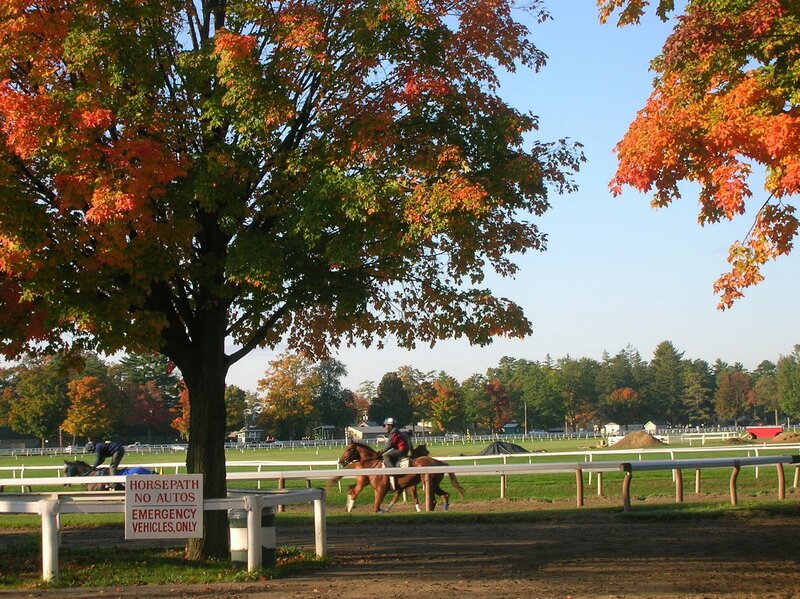 The attitude was business; the summer socializing left with the trainers and the horses in early September, and those left in Saratoga do their job knowing that they’ll seldom be interrupted by reporters, by owners, by visitors. The main gate to the track was open, and I wandered in…such desolation! Maintenance and security were about, and despite the emptiness, one got the sense that plenty of work was still going on. 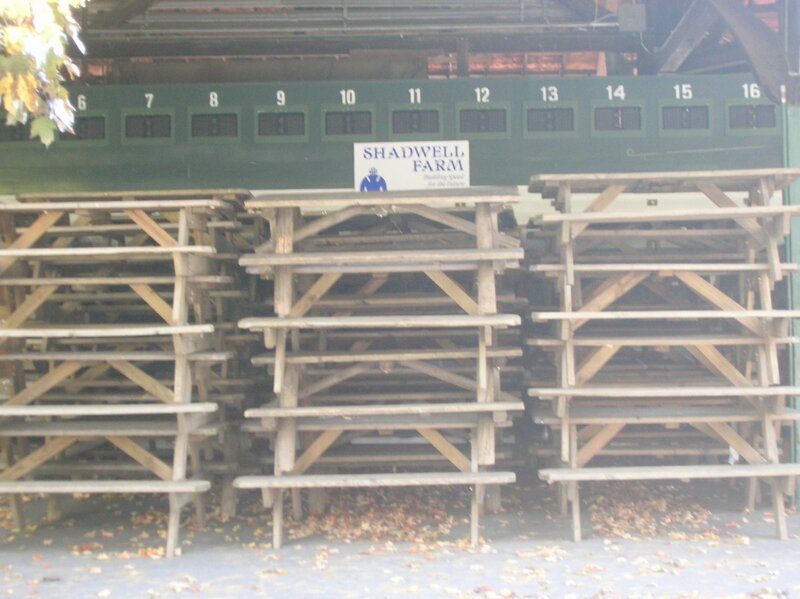 The benches were neatly stacked, blocking the betting windows, patiently waiting for next summer; the paddock stalls, stripped of their awnings, mirrored the denuded trees nearby. In another month or so, the Oklahoma, too, will shut down, and the workers there will take off for points south, whether that’s Florida, or New York, or Kentucky, or Louisiana. Snow will cover the backyard, and the summer place to be will be tightly under wraps until spring brings back the horses and the grooms and the verdancy. This post made me want to go get a cup of coffee to ward off the chill. 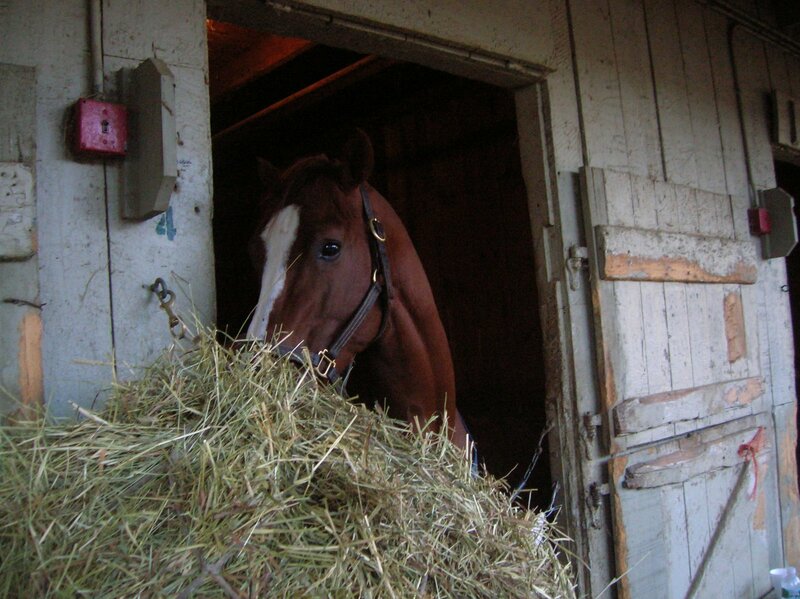 What is this Saratoga place people keep talking about?Thanks for the post; it’s almost as good as being there. Beautiful photos, beautiful images in your words. 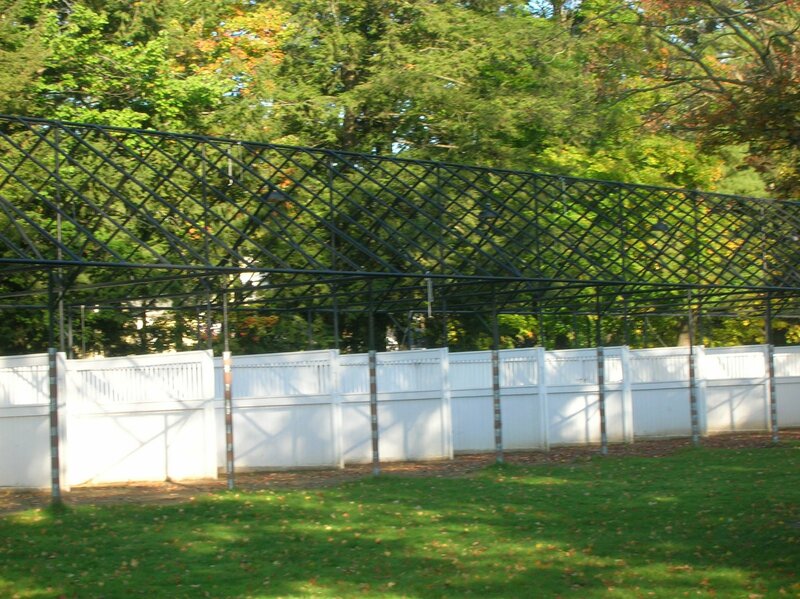 Beautiful photos…you’ve inspired me to make the trip to Saratoga next season. Lovely post and lovely photos, Teresa. 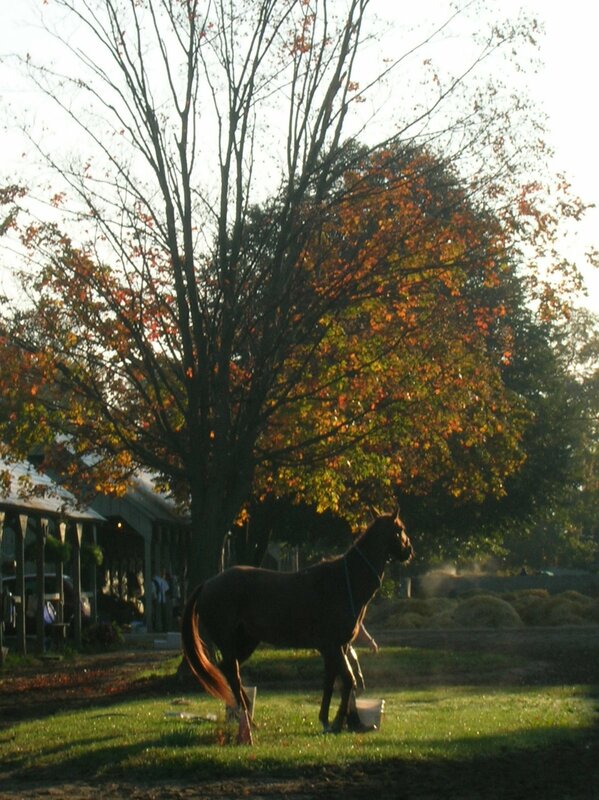 I have never seen Saratoga in the blaze of autumn. I bet you could find a place to park, too! And get into a restaurant!For the record: no, I don’t think it is too early to start the countdown to the 2009 opening day!franPS So did you see the NY Knicks? I heard they practice at Skidmore? 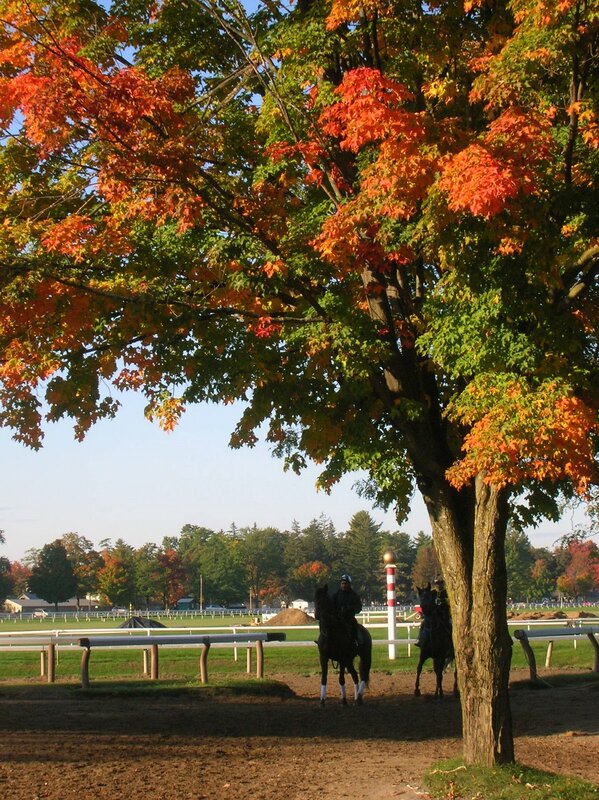 I haven’t the Spa in the fall for a long, long time …. brought back memories! The Knicks practiced for one week 9/29/08-10/04/08 at Skidmore in Saratoga Springs. The practices were closed to the public.Next year they are to return and they are exploring the possibility of having an open practice and autograph session.Tonight is the first good chance for a frost at the Spa! Me, too, John!Is this the same Winston who utterly disparaged Saratoga just a few short months ago? I didn’t see the Knicks, though there was plenty of reporting about them. Skidmore is my alma mater, and I’ve got a bunch of former students there, so maybe I’ll hear from some folks there. Thanks for reading and for the comments, folks. This might be my favorite post I have read on your blog! So relaxed and empty up there… what a great perspective. BB, Must have just missed you. Was there for 45min or so from 7am. There this morning as well before heading north, same kind of day as Saturday but very cold (30)something. 293 days to go. Hate the years when there’s 331 days between meet start and end-not least because I can’t stay for the last week!